Stop calling me a Troll! 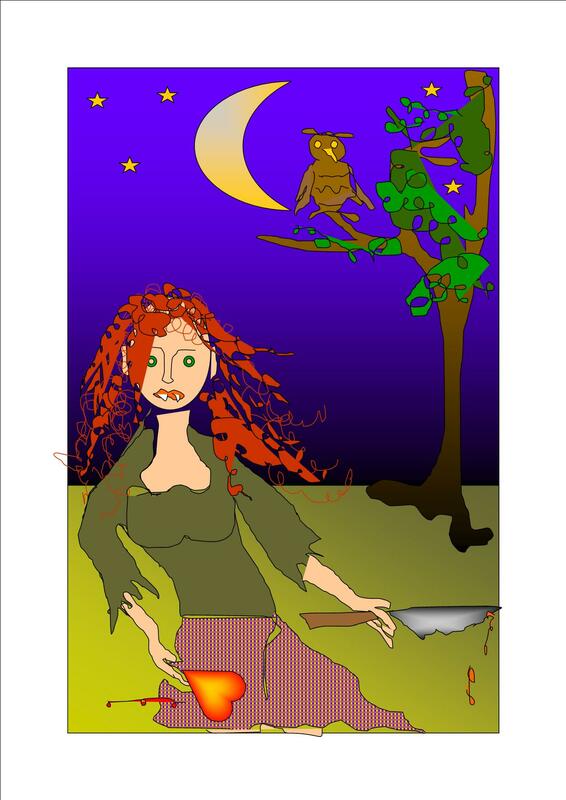 To those of you, who have already read Willow the Vampire and the Sacred Grove, it will come as no surprise to learn that trolls play a role in the on-going saga of Willow, her family and friends. I grew up at the Baltic Sea and Scandinavian mythology has therefore always played a part in my life. The creatures of Norse folklore, giants, elves, dwarves and trolls for example, are also part and parcel of my own heritage. In my Willow the Vampire stories I like to play with our perception of what is evil and what is not. In real life, not everything is clear cut, black or white. There are many shades of grey in between and sometimes the lines are rather blurred. As we have seen from this series of blog posts so far, many creatures of the night simply get a bad press because it suits humans to describe them as bad, as vermin, as something that’s in our way for whatever reason and must therefore be destroyed. I have no doubt that, if we came across a troll in the street, we’d be terrified at their appearance. We sometimes describe somebody as a troll to put them down, insult them and make fun of the way they look. In the Shetland and Orkneys, where Vikings once had settlements, the trolls changed to trows in a local adaptation of the Norse tongue the Viking settlers introduced into the islands. According to Wikipedia, the word troll now depicts somebody who puts out nasty online posts of an inflammatory nature or leaves nasty messages on forum discussion boards simply to provoke a response from the Internet community. An attention seeking idiot, in other words! The noun troll can even refer to the stupid post or message left by the internet fool, while in its verb form trolling refers to the activity of online harassment of other people’s Internet sites for example, such as those nasty people leaving horrible messages on tribute sites. The trolls of my blog post are most decidedly not of that ilk. Such people as the ones referred to above are in my mind better described as thugs, which is after all what they are. Norse trolls of Viking mythology origin are either devious or stupid, either pathetic or fiendish. It seems odd that one creature can be so many different things. So often in human history, when we see something we are afraid of, we lash out and shun or even kill, instead of finding out first about the other living being. Just because it’s ugly from our point of view, doesn’t mean it’s dangerous and or evil in nature. 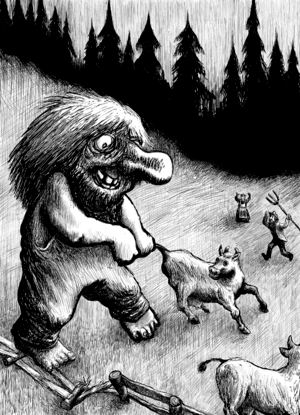 Troll mythology originates most notably from Norway. 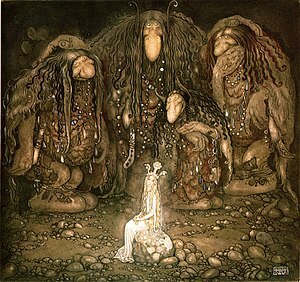 During Viking times there would have been all manner of trolls popping up in people’s conversations: from cruel giant trolls, which were similar in size and temperament to ogres in Britain, to more devious and human-like trolls that lived in the wild woods, underground in hills or caves or old burial mounds. Trolls have typically over-sized ears and noses. They are fond of riches such as silver or gold and are not adverse, in their giant form, to eating humans. There were mountain trolls and forest trolls, some hibernated in winter and came out again in spring, others were perceived as a year-round menace. When Willow and her friends finally come to meet a troll, they’ll have to decide for themselves, what manner of creature they are facing: good or bad, ugly or just sad and pathetic. Making our minds up about others without being influenced by hearsay, rumour, gossip or mass hysteria is a sign of being a responsible grown up, an adult with independent thought and integrity. At the start of book two Willow the Vampire will be 12-years-old, so it’s time for her to learn that not all that glitters is gold – and not all that looks ugly, is a nasty creature of the night deserving to die at the hands of humans. 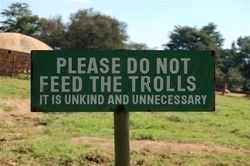 I know, I want one for our communal hallway to keep out future Grunters! This is a fantastic post. First of all you reminded me of the Orkneys and Shetlands. I have a friend who spent part of her childhood there and love to hear her stories. So tomorrow, when I see her I will be asking about that again. The stories of the trolls – how do we perceive people reminded me of a text very close to my heart Frankenstein – why do people behave the way they do? I can’t wait to see what happens when Willow meets a troll. I love that idea also – after all what is that old saying – one vampire’s blood is another vampire’s poison – well it was something like that My hairdryer has just set on fire so watch out seeing as we seem to have so many similar life occurrences. Glad I didn’t read your message until now – I’ve just finished drying my hair…and would have panicked at every little weird noise the thing makes, had I read this before. Poor you – hope you’re not sporting a Michael Jackson type hair-do now.